Hershey is one lucky dog. 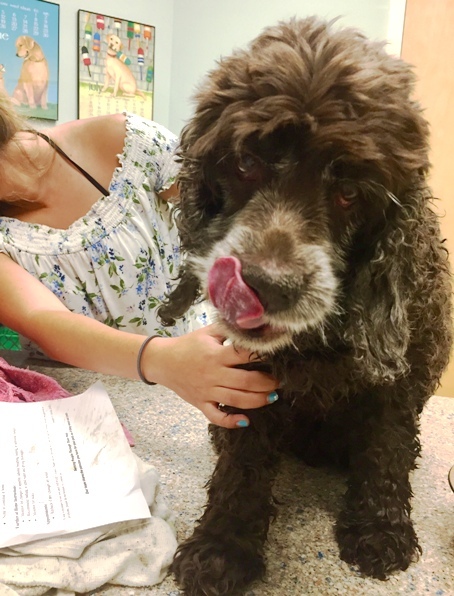 The 16+year-old brown cocker spaniel went missing this past Wednesday morning from her home in Dewey on the bayside of Saulsbury Street. “She’s a wanderer,” says Joyce Lauer of Mt. Laurel, NJ, one of Hershey’s caretakers. Not only is Hershey a wanderer, but she is also deaf. Around 7 a.m., Hershey snuck behind the Lauer’s beach home and apparently continued following the path along the Rehoboth Bay and disappeared! Meanwhile, the family started to worry. They soon contacted Dewey and Rehoboth police, and even started putting up fliers. It was a good thing they called Rehoboth Beach police too. Because around 2 p.m., workers at the Rehoboth Beach sewer plant heard a dog in distress in the nearby marsh and contacted police. Three Rehoboth Beach officers, Cpl. Bryson Ezell, Cpl. Dana Wyant and Sgt. Ray Edwards, came to investigate and by 3 p.m., the officers had initiated a rescue. In less than 20 minutes, using a small boat, they had saved Hershey and got her back to her family. The Lauer’s took Hershey to the Savannah Animal Hospital where she was given a “clean bill of health” despite her age and it being such a hot day. The swamp apparently kept her cool. “It was not her time,” Lauer said. “Savannah was wonderful,” she added. The family brought her home, washed her with Dawn soap and she ate and drank “a whole lot!” Hershey got her name because she is brown like the chocolate bar! The Rehoboth Beach PD bodycam video of Hershey’s rescue is posted here on YouTube. As an interesting note, a woman became lost in this marsh in 2012 and had to be rescued by helicopter.